There could be no greater compliment for our Norwegian lefse than the one we got from our school nurse, Elizabeth, who said the lefse–or potato crepes–we made in our food appreciation classes tasted just like the ones her Norwegian grandmother used to serve. Who knew? The Norwegians have their own version of a French crepe, except it’s made with potatoes instead of flour and eggs. So instead pouring a thin crepe into a pan, you have to roll it out. Apparently the mark of a truly gifted lefse maker is rolling a perfectly round, paper-thin crepe. For this, Elizabeth loaned us her grandmother’s special wooden lefse roller. The roller is textured, leaving a distinct pattern on the finished crepes. Otherwise, lefse are fairly easy. There are only only six ingredients: potatoes, heavy cream, butter, sugar, salt and all-purpose flour. The finished lefse are so simple, but delicious and comforting. Sprinkled with sugar or perhaps a dollop of fruit preserves, they make an easy dessert. Or you can stuff them with cheese for a savory snack or side dish. Recipes vary, calling for more or less potato, more or less flour. I found that 2 1/2 pounds potatoes make plenty of lefse for our needs–about 15 large, finished crepes. We measured the flour loosely, eventually just taking handfuls from the bag until we had a manageable dough that wasn’t sticky. A day ahead, peel 2 1/2 pounds baking potatoes, cut into large dice and cover with plenty of water in a large saucepan. Cook until the potatoes are tender, then drain in a colander and pass the potatoes through a ricer into a large mixing bowl. Add 1/2 cup heavy cream and 4 tablespoons (1/2 stick) melted butter, along with 1 teaspoon salt and 1 tablespoon granulated sugar (omit if making savory lefse). Mix well, cover and refrigerate overnight. The next day you’ll want to have some sort of griddle on hand along with butter to grease it. The Norwegians have a special electric griddle for this purpose. We made our lefse on our portable butane stove at the prep table so the kids could watch the crepes cook, using for a griddle our cast-iron Mexican comal, essentially a skillet with no sides to interfere with our efforts to get under the crepes and flip them with an inverted spatula. 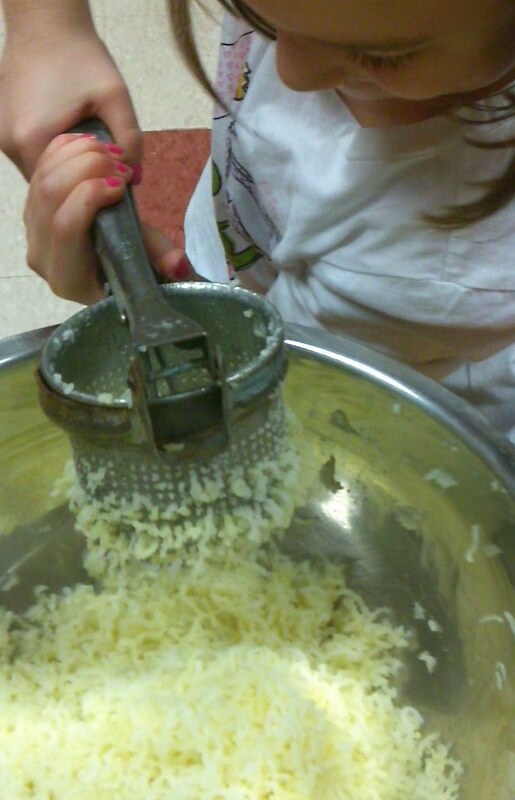 To the prepared potato mix, add 1 1/2 cups flour and work it in with your hands. Continue adding flour until a soft dough forms that is no longer sticky. You may need another 1/2 cup flour or more for this. Dump the finished dough onto a floured work surface and roll into a log about 3 inches across. You will cut pieces from the log to form individual lefse. Slice enough dough from the log to make a small fistful, roll it into a ball and, using your floured work surface and a rolling pin, roll the dough into a paper-thin, round (–ish!) crepe. Carefully work an inverted spatula under the crepe, then lift and move the disc to a buttered griddle over moderate heat. Within a minute or two, brown spots will appear on the underside of the lefse. Flip it with the spatula and cook another minute more. At this point you can sprinkle the lefse with sugar (or with grated cheese, if making savory lefse). 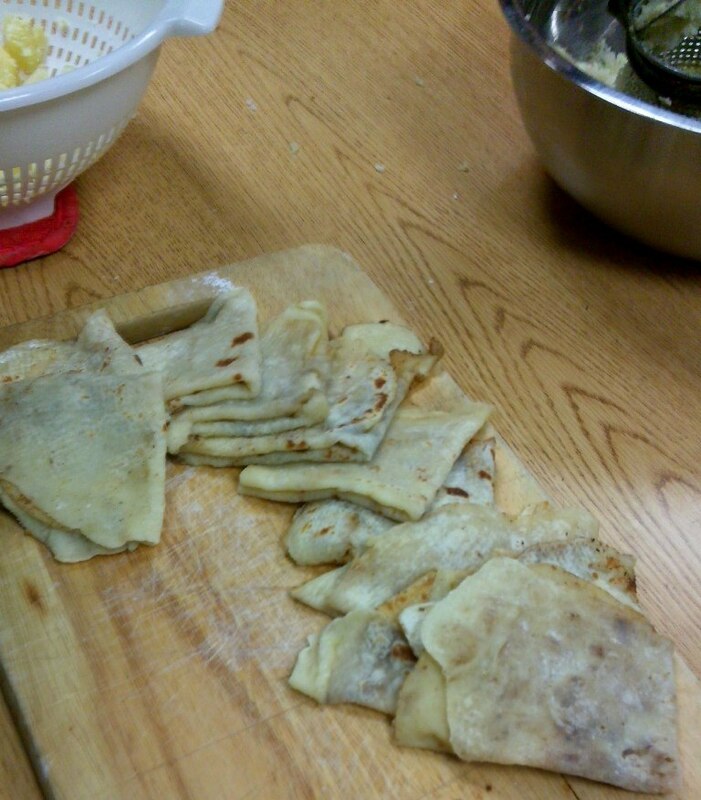 Fold the lefse in half twice to make a triangle shape. You can line the finished lefse on a platter to cool. You need do nothing more at this point than serve them, or perhaps dress them with a dollop of lingonberry jam. For savory lefse, you might want to place them into a hot oven to melt the cheese inside. Lefse are a simple peasant food that must have brought great comfort to Norwegian families during long, dark winters. Elizabeth also encouraged us not to worry too much about rolling our perfectly round ones. She said hers usually turn out more square. Mmmm, lefse! One of our favorite holiday traditions is the making of the lefse and tunbrod (swedish flat bread). Some of us prefer one, some the other – almost all of us like them best spread with butter 😉 We make masses, cool them separately, then stack them and store in plastic bags in the fridge for up to a week. Thanks for the tip, Alyson. We’re making cheese-stuffed lefse tonight to serve with chicken Caesar salad. Is that Norwegian?